Masons are one of the new generation of gin distillers, having been founded just 4 years ago – they launched their first gin on World Gin Day 2013. A few years ago, Karl Mason sent his wife a message via Facebook asking her to have a G&T ready for him when he got home from work. In response to the post, other friends started sharing photos of themselves enjoying a G&T and thus a Facebook group was born – one which resonated with the wider public and had 10,000 followers within a year. Before long, gin companies started to send Karl samples to promote to that audience. And he started to realise that many of the gins he was trying tasted the same. He wondered if he could create a new gin that tasted distinctly different from the rest. That question resulted in the development of Yorkshire’s first gin. 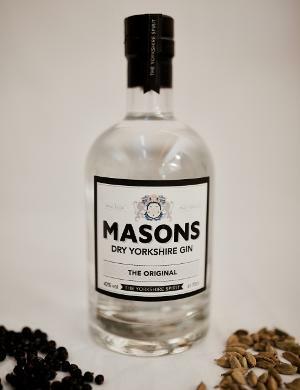 Although named Masons Dry Yorkshire Gin, this is strictly speaking a London Gin – the legal definition having nothing to do with where the spirit is actually produced. The aroma is initially very citrus-heavy – satsuma and lemon peel, along with a stronger kick of alcohol than the 42% ABV might suggest. Over time woody spice notes come through, with cardamom and cloves joined with a very subtle touch of juniper. In the mouth it’s sweet, with a distinct cardamom kick right away. Pretty quickly that’s joined by warm orange flavours and a nice peppery heat, and the cardamom fades a little but it still lingers right through to the finish. If you’re a fan of cardamon, this might be right up your street. Personally, it’s not a spice I’m a massive fan of, and it’s such a key flavour to the spirit that it’s hard to appreciate those other sweet, fruity notes. 2 stars for me, maybe 3.5 if you love cardamom. Many thanks to Masons who provided this for our Christmas Gin Guide.